The inspiration for Jonathan Dove’s opera The Day After, being given its UK premiere by English National Opera, is the Greek myth of Phaeton, whose futile attempt to control nature brings on global catastrophe. This myth is a fitting one for our times, as we reckon with the consequences of self-created environmental destruction. 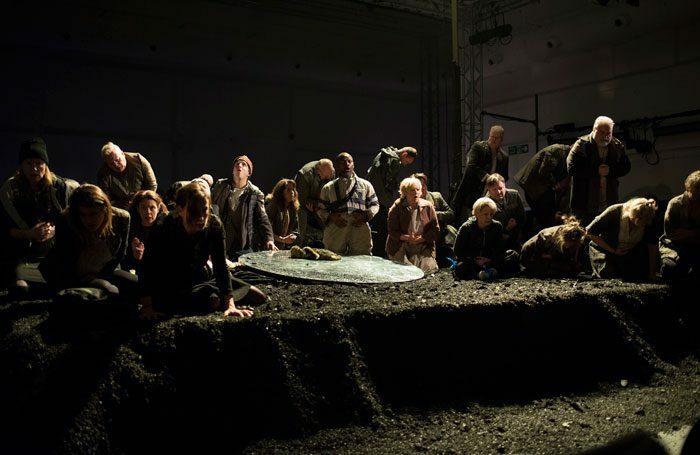 In the vast space of Studio 3 at Lilian Baylis House – once Decca’s recording studios, now ENO’s rehearsal space – a bleak, post-apocalyptic world is effectively evoked with little scenery and few props. The survivors plead with Woman/Mother – a commanding Rachael Lloyd – to relive the story. She tells how her son, Phaeton – William Morgan, who finds his stride after a rocky start – journeys to the palace of his father, the sun god Phoebus, played by a dramatically and vocally confident Robert Winslade Anderson. Phaeton persuades his father to let him drive the chariot of the sun across the sky, but the horses are too strong for him and disaster ensues. This climactic scene, as the boy brashly tries to master the horses, goes on too long, but his death, at the hands of his horrified father, and the aftermath are emotionally compelling. Dove’s score, well played by the ENO orchestra, and tinged with traces of Bernstein, Britten and early John Adams, is appealing despite not having a strong personal stamp. The ENO, under its new artistic director Daniel Kramer, is to be applauded for venturing out of its Coliseum home and turning the spotlight on the excellent ENO chorus for the first instalment of its ENO Studio Live initiative.